The main teaching of the Christian Church is Jesus Christ Himself. In Armenian Church circles, sometimes people put so much emphasis upon the importance of the Armenian Church as such, and her cultural and national values, that they often forget the central reality in their faith. In fact, without Jesus Christ, there is no Church nor Christianity. Jesus Christ is the soul and center of Christian life. The first instruction in our faith, is to love and adore our Lord Jesus Christ. Christ became a man like us; a man who could cry on seeing the tears of the helpless sisters at the death of their brother, Lazarus. (John 11:1-44) He could weep over Jerusalem. (Luke 19:41-44) He could feel the fatigue of long journeys and ask for water to quench His thirst. (John 4:6-7) However, He was also at the same time true God. The life and teaching of Christ has been transmitted to mankind through the Gospels. We Christians believe that the Gospels are divinely inspired. Apart from this, the Gospels are historical documents, the genuineness and the reliability of which have withstood the acid test of scientific investigation. No matter what people say or believe about Christianity, today no books is so much in demand as that of the Gospels. The New Testament is the greatest book in the world and the best seller of all times. The greatest fact, which men of this materialistic era are inclined to forget, is that Christ is the fullness of Divine revelation. It is not His teaching which makes Christ the greatest figure in history. It is His Divine Person which differentiates Him from other religious leaders. The whole structure of His teaching stands upon His person. We see in the Gospels that when Jesus speaks, He speaks not as an ordinary teacher, but with divine authority. For example, after that long and magnificent sermon which is known as the “Sermon on the Mount” (Matthew 5:1-48), this was the impression of his hearers as recorded in the Gospels; “When Jesus had ended these sayings, the people were astonished at His teaching for He taught them as one having authority and not as the scribes”. On one occasion Jesus asked His disciples: “Whom do you say that I am?” Simon Peter said, “You are the Christ, the Son of living God.” (Matthew 16:16). If Peter were mistaken, or carried away by his enthusiasm, it would have been the duty not only Christ, whom we know from the Gospels, but of any other honest man, to correct Peter and remove a false impression. On the contrary, Jesus confirmed the truth of what Peter said, by assuring him that his answer was divinely revealed to him. It is obvious that this expression, “The Son of living God”, is not used for Christ in the vague sense in which all good Christians are children of God. We are sons and daughters by grace and adoption; Christ is Son by nature. The evidence of the divinity of Jesus would be incomplete, if we did not consider also the testimony of our fathers. They speak and testify concerning this truth, not merely with words, but with the far greater eloquence of their sufferings and death. Their life, blood, which they gave for the sake of their Savior, has placed upon their faith the seal of conviction which neither time nor eternity can break. What is the most important part of the Badarak? One could list many parts of the Badarak that are theologically rich or spiritually moving; rituals that are particularly impressive; elements of ceremony that are historically significant or inspirational on a personal level. Anyone who participates regularly in the Badarak will surely have his or her own idea of the most important part of the service. From the perspective of the overall intent of the Divine Liturgy, however, based on the importance that Jesus gave the Eucharist when he instituted it at his last supper, and based, furthermore, on the objectives and vision of those who assisted in compiling the service, there are two moments in the Badarak that are most important: Holy Communion and the reading of the Gospel. In both of these mysteries or “sacraments” of the Divine Liturgy, God comes to be with us. In Holy Communion God comes to be with us by means of the Body and Blood of his Son, Jesus Christ. As for the reading of the Holy Gospel, our church fathers insist that we are not simply hearing ancient words of wisdom, but are encountering the very Word of God, Jesus Christ, who comes to be with His church and with each one of us. In this way, through the Divine Liturgy, we become truly filled with the loving presence of our Lord Jesus Christ; with his divine power, and with his transforming grace. How often should I attend Badarak? You should attend Badarak and participate in it attentively every time it is offered for the rest of your life. From the very beginning the Armenian Church has made the Badarak the very center of its life, establishing that it be celebrated every Sunday without fail. At the Last Supper, when Jesus established the Eucharist (Divine Liturgy or Badarak) he said, “Do this in remembrance of me” [Luke 22:19, 1 Corinthians 11:24,25]. Jesus is telling us that the Badarak is the premiere means by which we can keep God foremost in our lives, in our hearts and minds. In the Badarak, especially when we receive Holy Communion, we encounter God and are filled with his power and love in the most immediate and intimate way possible in this life. You should consider the regular reception of Holy Communion to be at the center of your life as a member of the Armenian Church. There is no doubt that the earliest Christians understood the celebration of the Eucharist and the joyful reception of Holy Communion to be the greatest privilege and blessing of Christian life. Jesus said, “He who eats my body and drinks my blood dwells in me and I in him’ [John 6:56]. St. Paul wrote, “For as often as you eat this bread and drink the cup, you proclaim the Lord`s death until he comes” [1 Corinthians 11:26]. To share in the Lord`s Supper is to profess and to celebrate our faith that in Christ, sin and death will no longer separate us from eternal life with God. To receive Holy Communion is to receive the living Son of God into our bodies and into our lives as divine sustenance; as “medicine for forgiveness;” as “forgiveness and expiation of sins,” for protection against evil, and “for health of soul and body and for the performance of all deeds of virtue,” as the prayers and hymns of our Badarak continually proclaim. 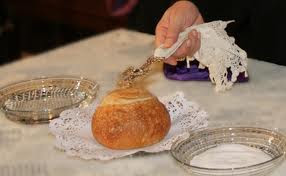 Eagerness to receive Holy Communion must always be complemented by reverence for sanctity of the sacrament, which one must not allow to become a casual or indiscriminate habit. Should the congregation sing with the choir? To answer this question we first need to understand what the role of the choir is in the celebration of the Divine Liturgy. If we look carefully at the words of all of the hymns and choir parts of the Divine Liturgy one thing becomes apparent: the choir represents the worshipping voice of the people. The hymns express our prayers to God and our faith in Him. Just as the priest and deacon have a specific function in the liturgy, the people too are part of the Badarak`s prayerful dialogue between Godand His people. Our words and deepest convictions as a worshipping community are expressed by the choir. So the choir`s role is not to entrain or perform for the people, but to lead the faithful in their participation in the liturgy. To sing the music of the Badarak in a manner that is prayerful, correct, beautiful, and worthy of God requires deication and commitment as well as regular rehearsal. Therefore, people who have the desire and the talent required to participate in the music ministry of the church should formally join the choir. Others should feel free to sing softly with the choir, being sure that their voice does not compete with, or detract from the sound of the choir. What should I say during the Kiss of Peace? The person offering the kiss of peace says: Kreesdos ee mech haydnetsav (“Christ is revealed among us”). The person offering receiving the kiss of peace says: Orhnyal eh haydnootyoonun Kreesdosee (“Blessed is the revelation of Christ”). The person offering the greeting places his right hand over his heart and approaches the person with whom he is sharing the greeting, bowing his head slightly, first toward the left, then toward the right. The wedding in Cana is the setting for the first of seven signs (miracles) performed by Jesus in the Gospel of John, which ultimately point to the truth that the Kingdom of God has dwelled among us in the person of Jesus Christ. After this one miracle, which inaugurates his visible ministry, Jesus’ life would never be the same. The needs of the people are so vast, numerous, unique unto each person, that His time would now be occupied with preaching, teaching, and healing. He would become loved, hated, tested, a controversial threat to the system. With that risk in mind, without His disciples yet chosen, He yields to His mother’s request to remedy the situation of running out of wine. Consider our own failures and disappointments. Does our ministry as individuals, as a parish, reflect the kind of risk to cross a line from which we can never return? Are we known as and considered a source of healing for others? When people meet us or hear about our parish, do they associate us with the same person in Cana who had compassion and gave enough attention to the situation at hand to meet the need of the hour? The wedding in Cana is replete with sacramental themes of transformation. The jars of water for purification remind us of baptism. The wine, of course, reminds us of the Blood of Christ in Holy Communion. In fact, the wedding is a foretaste of the final Banquet, the same Banquet in which we participate in the present during every Badarak (see Matthew 22:1-14). Interestingly, the Wedding in Cana is depicted in Armenian iconography as an image of the Badarak. Jesus is shown at the head of the table, fully present to fulfill our lack. Mary the Mother of God is seated to His left. In the center of the image are the crowned bride and groom, and to the far right is the host of the wedding celebration. A chalice (not seen in the image) is prominently located in the center of the image drawing our attention to the Eucharistic aspect of Jesus’ first miracle (See Revelation 19:7). Jesus wants to fill us with divine life, abundant life (see John 10:10). His desire is to transform us, to have us become a people zealous for good deeds, to love like He loves. We experience this transformation through baptism and Communion, through living out our Baptism and allowing the Body and Blood of Jesus Christ to transform us. Holy Communion is not a magic pill that we passively take to cleanse us from moral infractions, but the Divine Life of Christ that is shared and unites us with God, if we allow it to take root by not resisting what it means to live and love like Jesus. Salvation is an active participatory life in Christ, not passive as if nothing else is required of us. Through us, our abundant life flows out to meet the needs of others. When we come to the New Testament, we find that marriage is elevated to a level not even known among Jews. John, in his Gospel, tells us the famous the story of Jesus at the wedding in Cana. As the wedding celebration is moving along, something disastrous takes place. The wine runs out! But Jesus rescues the situation. He instructs them to fill six large jars with water, then draw some out, and take it to the host. That party not only resumed, but was dignified, and not with just any wine, but an exquisitely fine wine. The marriage of a man and a woman is nothing less than a reflection of God’s love for His people, a force that is so potent that its end result is unity, oneness. In that same passage from Ephesians, which we read at every Armenian wedding service, St. Paul explains that the mystery of two becoming one flesh refers to Christ and the Church. When we celebrate the crowning of a man and a woman, we celebrate Christ’s marriage to the Church. So marriage is a Holy Communion. Holy Communion is not just something placed on your tongue during the Badarak. It’s the essence of the Gospel: “Emmanuel, God with us.” And that is to what the miracle at Cana points. The Kingdom of God is here, present, in a person, in whom we become one with one another in the Church, His Body. That’s Holy Communion.